On October 31, 1927, Hoagy Carmichael and His Pals recorded “Stardust” at the Gennett Records studio in Richmond, Indiana. Hoagy’s “pals,” Emil Seidel and His Orchestra, agreed to record the medium-tempo instrumental in between their Sunday evening and Monday matinee performances in Indianapolis, seventy miles away. In 1928 Carmichael again recorded “Stardust,” this time with lyrics he had written, but Gennett rejected it because the instrumental had sold so poorly. The following year, at Mills Music, Mitchell Parish was asked to set lyrics to coworker Carmichael’s song. The result was the 1929 publication date of “Star Dust” with the music and lyrics we know today. The Mills publication changed the title slightly to “Star Dust” from “Stardust” as it was originally spelled. Mills Music was owned and operated by brothers Irving and Jack Mills. Irving Mills was a songwriter and singer but is probably best remembered in his role as publisher and band manager, in particular with the Duke Ellington Orchestra. In the latter half of the 1920’s Irving Mills recruited musicians for recording sessions using the names The Whoopee Makers and then Irving Mills and His Hotsy Totsy Gang. Band members would change almost month-to-month, but at some point these groups included top names such as Benny Goodman, Bix Beiderbecke, Jack Teagarden, Tommy Dorsey, Jimmy Dorsey, and Hoagy Carmichael. Irving Mills and His Hotsy Totsy Gang recorded “Star Dust” on September 20, 1929, on the Brunswick label, and the song rose to number 20 on the 1930 pop charts. Shortly after the Mills recording, Isham Jones and His Orchestra recorded “Star Dust” as a romantic ballad, and their recording became a top-selling, number one hit. There are many accounts of how “Star Dust” came to be written. Carmichael tells his version in autobiographies The Stardust Road (1945) and Sometime I Wonder (1965); Will Friedwald devotes a 36-page chapter to the song in his book Stardust Melodies (2002); and Richard Sudhalter discusses the origin of the song in his Carmichael biography Stardust Melody: The Life and Music of Hoagy Carmichael (2002). According to the songwriter, inspiration struck while visiting his old university campus. Sitting on a wall reminiscing about the town, his college days, and past romances, he looked up at the starlit sky and whistled “Star Dust.” Sudhalter’s biography contends that the melody may have begun with fragments, evolving over months and maybe years, but Carmichael preferred to perpetuate a myth that sweet songs are conceived in romantic settings. This section suggests definitive or otherwise significant recordings that will help jazz students get acquainted with “Star Dust.” These recordings have been selected from the Jazz History and CD Recommendations sections. The version of “Stardust” that has had perhaps the greatest impact on the jazz world is Louis Armstrong’s from 1931 (Ken Burns JAZZ Collection: Louis Armstrong). His trumpet and vocals are both heard at full maturity on this performance which ranks as one of the great early ballad performances in jazz history. Hoagy Carmichael’s own versions are also important for obvious reasons, with his mid-1940s small combo recording (Ole Buttermilk Sky) serving as a particularly good starting point. Despite being “all over the place” (over the range of a tenth), this tune stays firmly in a single key throughout. Musicians have commented on its resemblance to the improvisational style of cornetist Bix Beiderbecke (who was a good friend of composer Carmichael). The opening harmonic sequence, IV – iv – I – iii – VI7 – ii – VI7(+5) – ii – V7 - I bears strong resemblance to the second half of “After You’ve Gone,” except for the insertion of the iii chord and the extended V7 (actually turning into a V7(+5) before resolving back to I) in place of the second iv chord. The “B” section is a long II7 – V7exchange, with the II7 becoming minor before resolving to the last V7 – I, event though technically, the I chord at that point – a I7(+5) – is really a V7 of the upcoming IV (F major in the original). “C” contains a bit of a surprise; starting out with IV – iv, it returns to the tonic and its relative minor (I –vi, or C major and A minor in the original). Instead of going to the logical ii7 (or even III7), however, Carmichael goes to a VII7 (Am – B7). This resolves to the III7 (E7), as might be expected, but then goes to ii7 before the logical resolution of VI7 (A7). The VI7 resolves normally to the final ii7 – V7– I progression. Why Carmichael took the detours is hard to say; melodically, an E7 in measure 4 of section “C” would have worked just as well and made more sense from a tonal standpoint. Such deceptive resolutions were prevalent in late Romanticism and Impressionist music, both of which of were strong influences on Bix Beiderbecke’s music. On November 7, 1940, a milestone in jazz recording occurred. 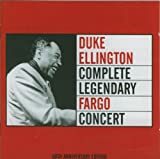 Duke Ellington and His Orchestra, on a US tour, performed in Fargo, North Dakota. Two local Ellington fans had arranged to record the band live, a rare occurrence in those days of primitive recording equipment. During the course of the evening, the Ellington band swung through many of their great arrangements. At one point, a patron requested “Stardust,” a tune for which Ellington didn’t have a special arrangement. Tenor saxophonist Ben Webster, in a performance remarkably similar to Coleman Hawkins’ “Body and Soul” of the previous year, did an impromptu four-minute improvisation on the number. His version, which wasn’t commercially released until the 1970s, became Webster’s own favorite recording. This is one of the classic performances displaying Armstrong’s emergence as a compelling frontman in a large ensemble environment. Hamp’s epic live version of “Stardust” distributes solos among the all-star band, which includes such jazz giants as trumpeter Charlie Shavers, alto saxophonist Willie Smith, bassist Slam Stewart and guitarist Barney Kessel. Terry shows off his mastery of bittersweet ballads on this performance, which also features an energetic turn from tenor saxophonist Johnny Griffin. We get to hear Coltrane’s contemplative side here with the understated accompaniment of Red Garland, Paul Chambers and Jimmy Cobb. This features wonderfully sensitive interplay between Stitt’s alto and Gonsalves’ tenor, and each saxophonist shines on his own as well. Bassist Carter plays a touching version of “Stardust” accompanied only by the piano of Sir Roland Hanna. In one of the singer’s earliest recordings she plays it straight with a beautiful ballad version. Hendricks wrote lyrics to Louis Armstrong’s version of “Star Dust” and sings them here with Judith Hendricks and the Vocalstra in a unique take on the classic. The master plays and sings the definitive version of “Star Dust”’ on this compilation that shows Carmichael to be arguably the finest singer-songwriter of all time. This version, captured live at Oberlin College in Ohio, hints at the new directions Brubeck would be taking jazz with Time Out. This album features a laid-back arrangement from the bluesy, hard bop saxophonist. The under-appreciated Donaldson trades some tasty solos with guitarist Grant Green. The song introduced this early Marsalis album and proved without a doubt that the trumpeter had something to say. “Star Dust” is the crown jewel of this excellent album.